If you or a loved one has ever had cancer, you know that sometimes it’s the little actions that mean the most. 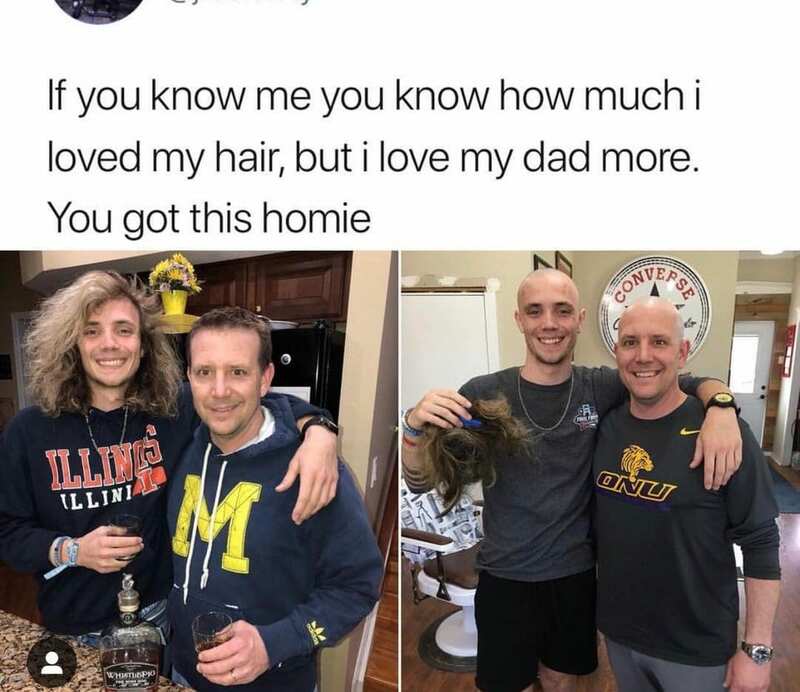 For this son, a small action that he could take was cutting his long hair to match his Dad’s bald head. A meme that is centered a father/ son relationship? Most definitely a wholesome meme, and a meme that’s about a son being there for his dad while he battles cancer? That takes the wholesome meme award for us. Hopefully his Dad makes a full recovery. Are you kidding? A little bird wearing shoes to straighten out their feet? Can’t get much more wholesome than this. 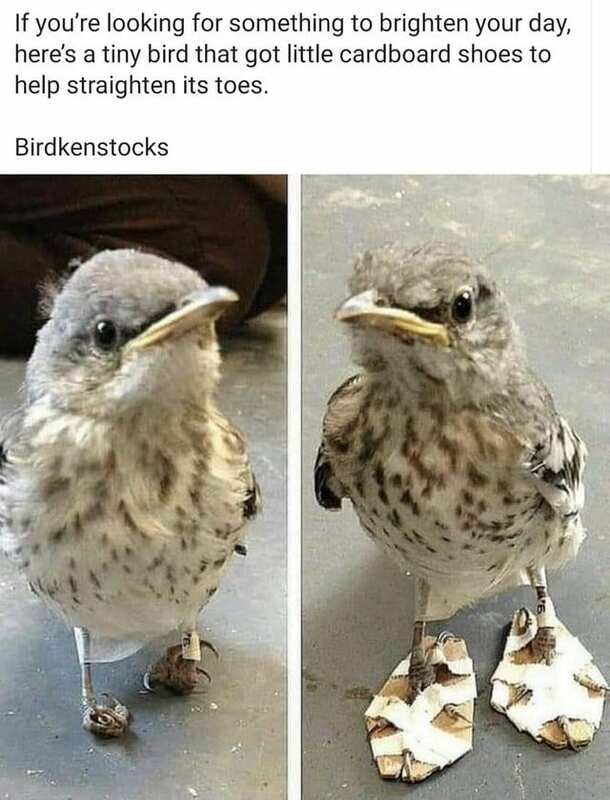 Looking at this meme though you have to ask, what genius thought of this amazing way to straighten out this bird’s feet? And how in the world did they get close enough to this bird to make the shoes. In our opinion, we all need a follow up to this meme. More birdkenstocks for us, please. This adorable meme about a man and a tiger is about something we all care about: our friends. We love relationships that describe the OP’s (original poster) relationship with their friends in a positive and happy way. 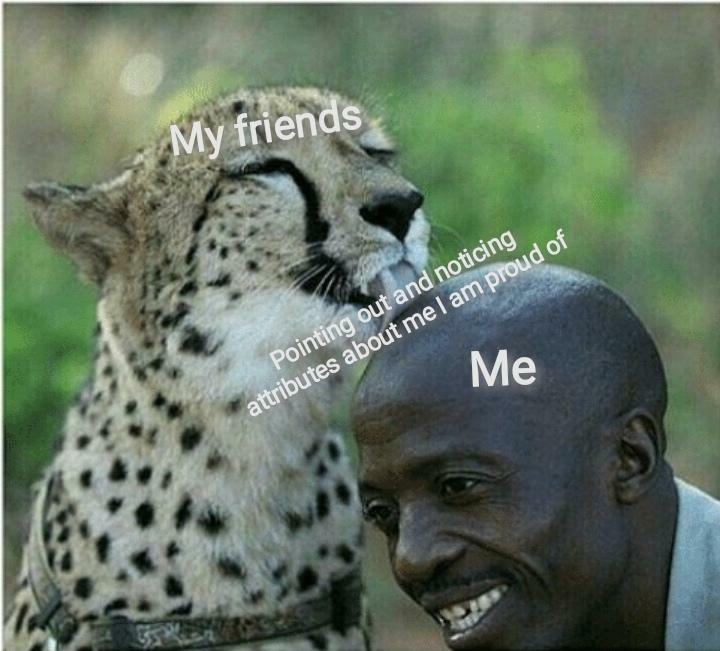 In this meme, the tiger is licking the head of the man, and the tiger refers to his friends, the tiger’s tongue is “pointing out and noticing attributes about me that I’m proud of” and the guy is “me” which basically means that his friend’s are nice and great! We love that! 4. Dress How You Want! Have you ever had people comment on your outfit? This guy certainly did in this cute meme. 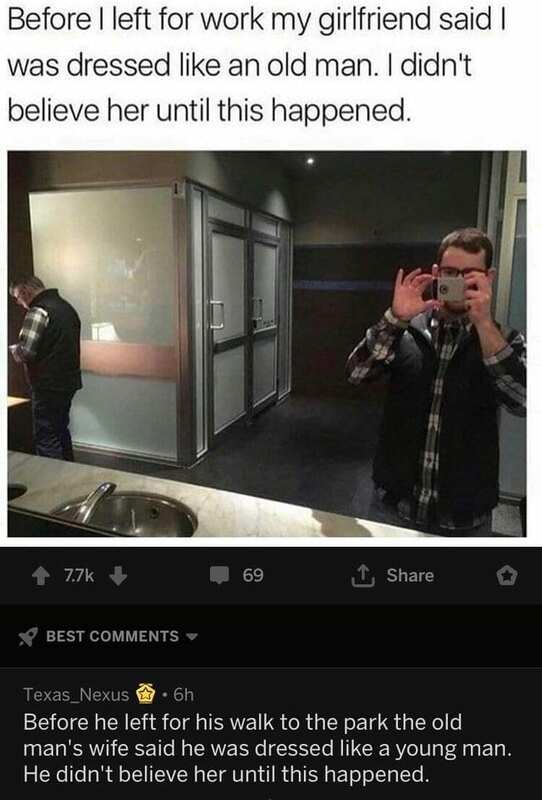 In the top of the meme, the younger man (the guy taking the selfie) is saying that his girlfriend commented that he was dressed like an old man, and he didn’t believe her until he saw an older man wearing the exact same outfit. Then in the comment, the top commentator is imitating the older man’t thoughts, saying that HIS wife said he was dressed like a young man and he didn’t believe her until he saw the man taking the selfie. So cute! We’ve all done things we’re not proud of. 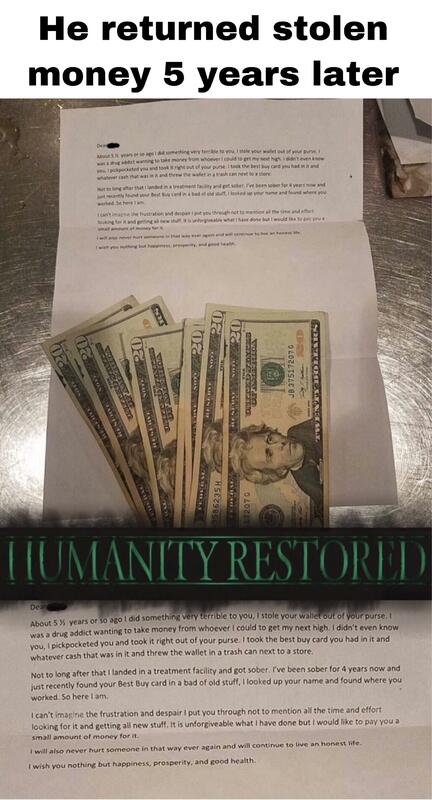 This guy found a way to make reparations about something in his past that he always felt bad. As you can see from the meme, the OP had their wallet stolen, only to get a wonderful surprise five years later when the thief delivered a handwritten apology to their work. If you were the OP, would you forgive this person? 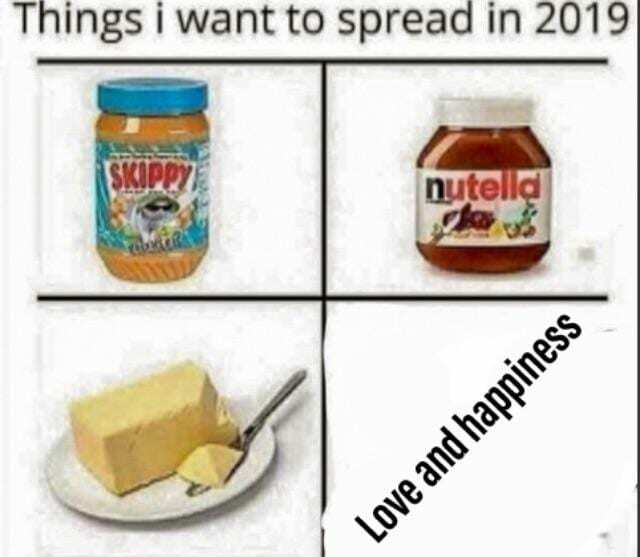 What else would you want to spread in 2019? I can’t think of anything besides peanut butter, jam, butter and obviously love and happiness. 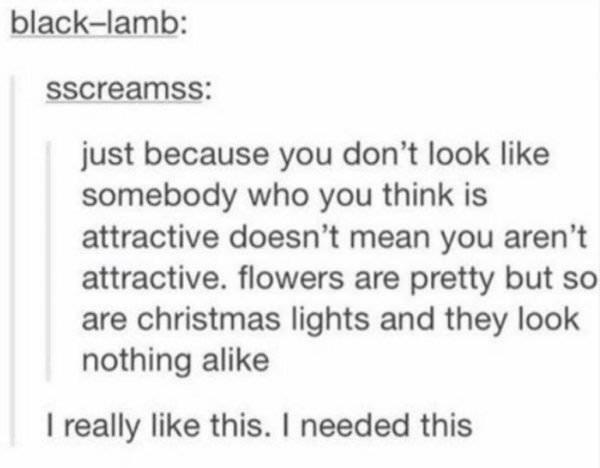 We love this meme because it is actually spreading a cute message as well as being nice. It’s saying that instead of just consuming good karma, we should also be putting it back into the world and we are agree with that. Aw, another nice friendship meme. 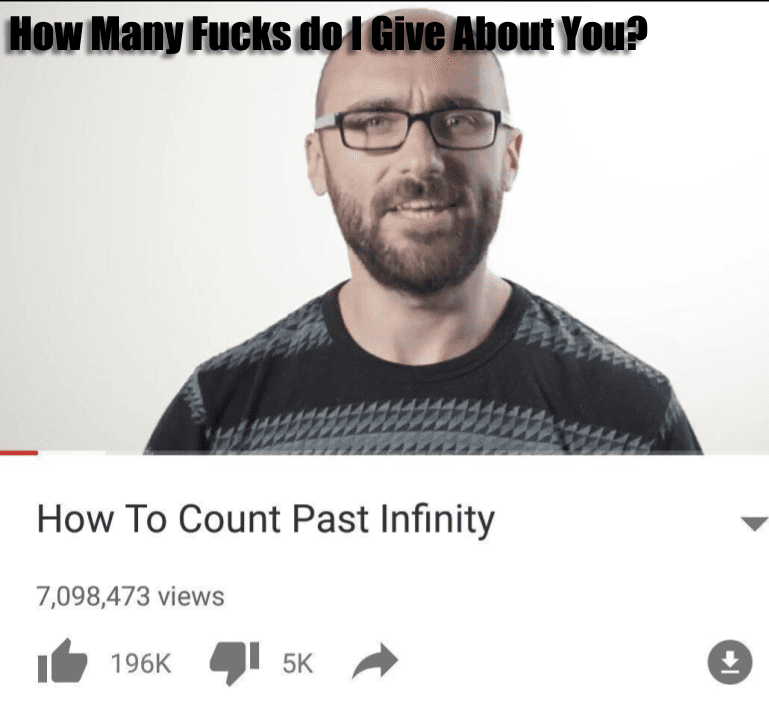 In this meme, the captain says “How many fucks do i give about you?” And then they reference the title of a Youtube video called, “How To Count Past Infinity” which obviously means that the OP cares about you more than infinity. We should all care so much! 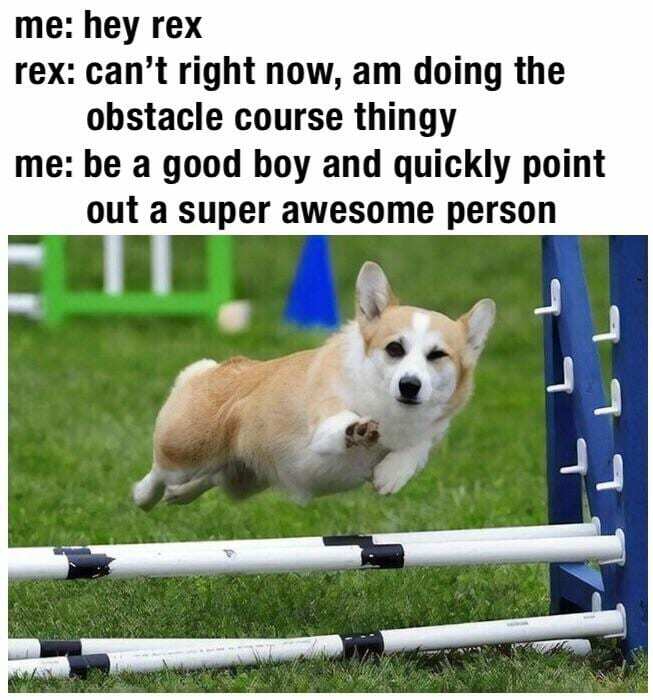 Rex has a message for you and it’s that you are super awesome! Of course, most dogs seem to think people are awesome as long as they give them food and pets. Actually, most people think you’re awesome if you give them food and pets too so maybe it’s not just a dog thing. Did you ever read or watch Winnie The Pooh? If you did, you know that Winnie has a lot of nice and kind messages for humanity and the message in this meme is definitely one of them. 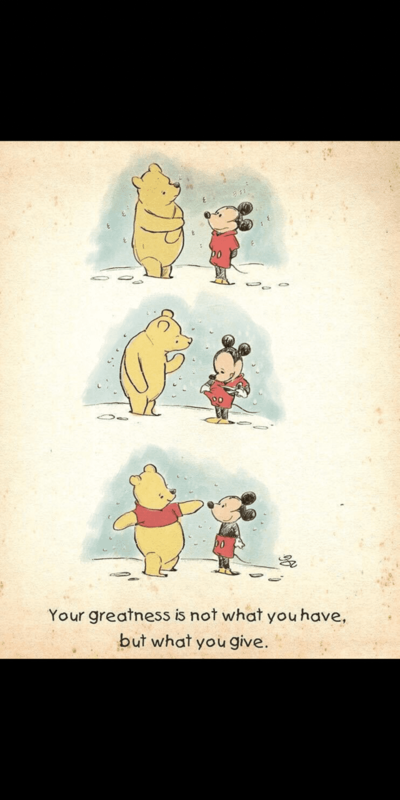 In the meme, Winnie is naked and seems to be cold so Mickey Mouse cuts off the top of his outfit and gives it to Winnie, completing both of their outfits. Yes, we know they’re supposed to bring bad luck but black cats are just as cute and good as other pets. Although we don’t condone petting stray cats, if you run into a sweet cat like the one in the meme below, you should definitely pet it! Any meme that reminds us to checkin with ourselves? Yes, we are here for that. In an age where we’re all working and stressed out so much of the time, these reminders are important and useful for our mental health. 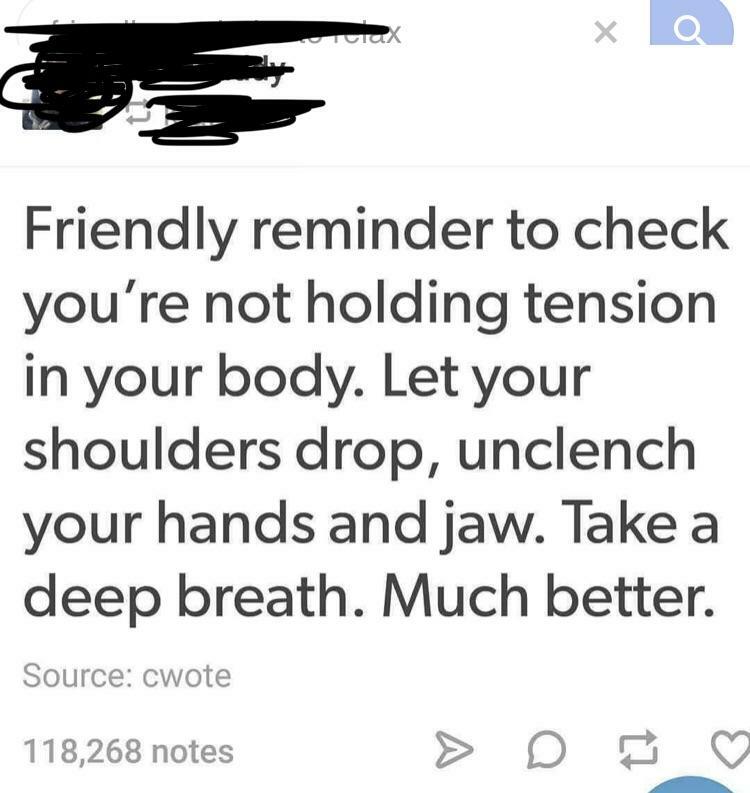 Here take a second and take a deep breath. Do you feel better? We sure do. By this time, we’ve all seen a bunch of alien invasion movies. Usually involved a lot of fighting. Not in this wholesome meme edition. 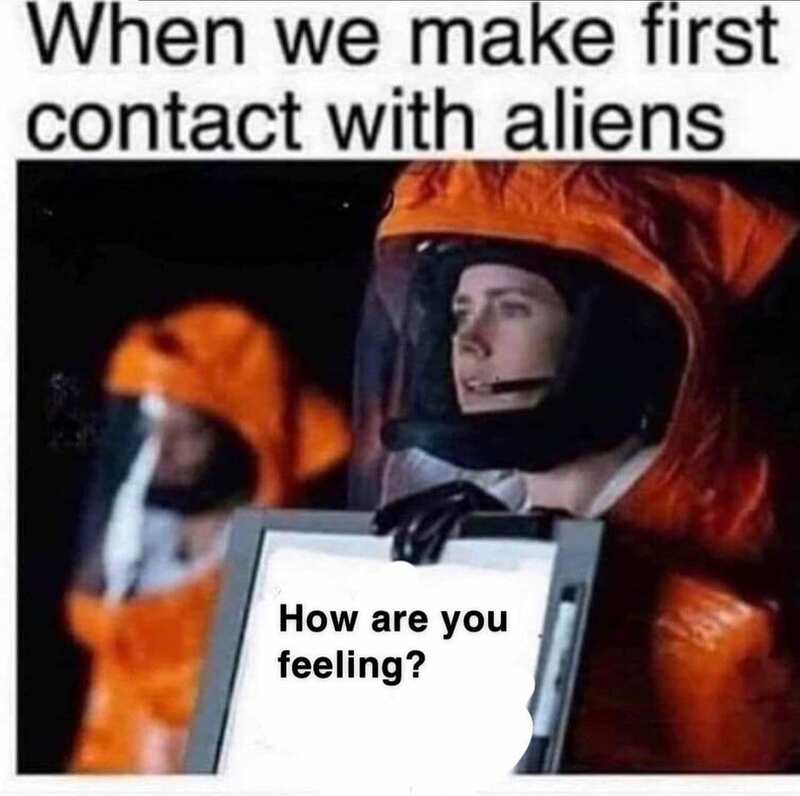 In this wholesome meme, the first thing we say when we first meet the aliens is “How Are You Feeling.” Now this is a message of peace we can get behind. We know that the internet loves dogs and this meme is no exception to that rule. 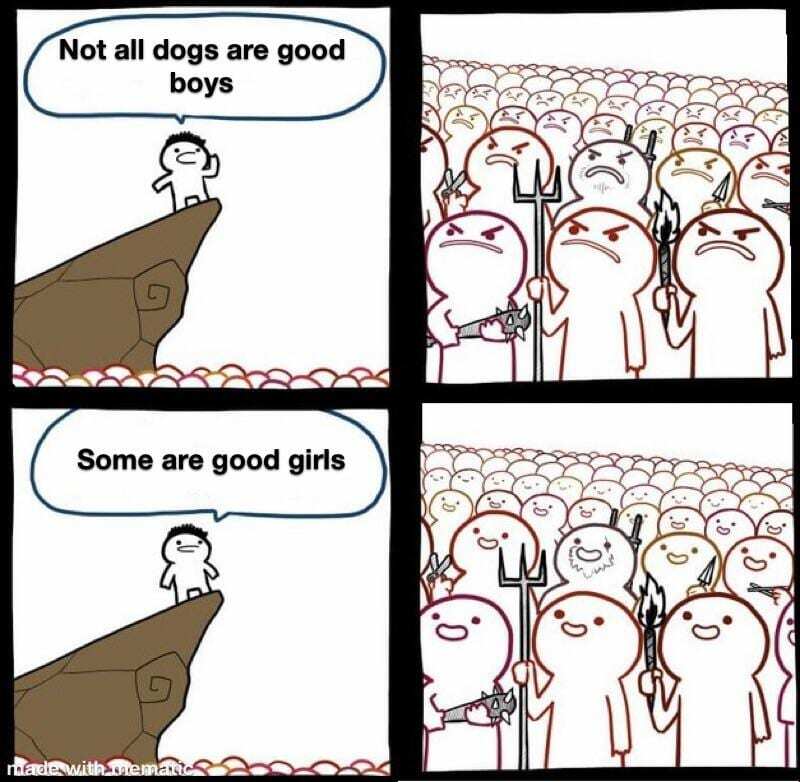 In this meme, the guy yelling exclaims that “not all dogs are good boys” and everyone gets SO angry! But then when he says some are good girls. This meme is commenting on how everyone on the internet loves dogs and gets irrationally angry when anyone says anything bad about them. Awwww! This is so sweet. 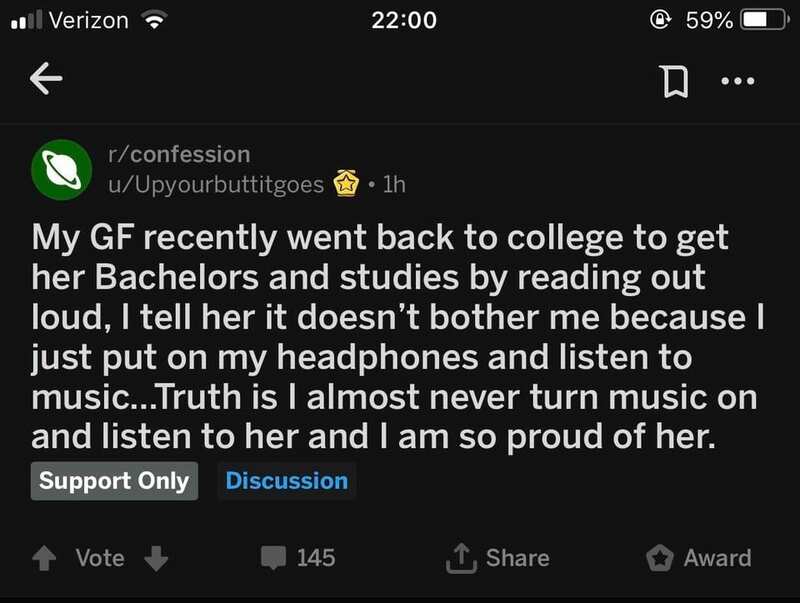 Support is one very wholesome thing, and this boyfriend being proud of his girlfriend for going back to school and studying certainly falls in that category. The real question though: has the girlfriend seen this meme yet? 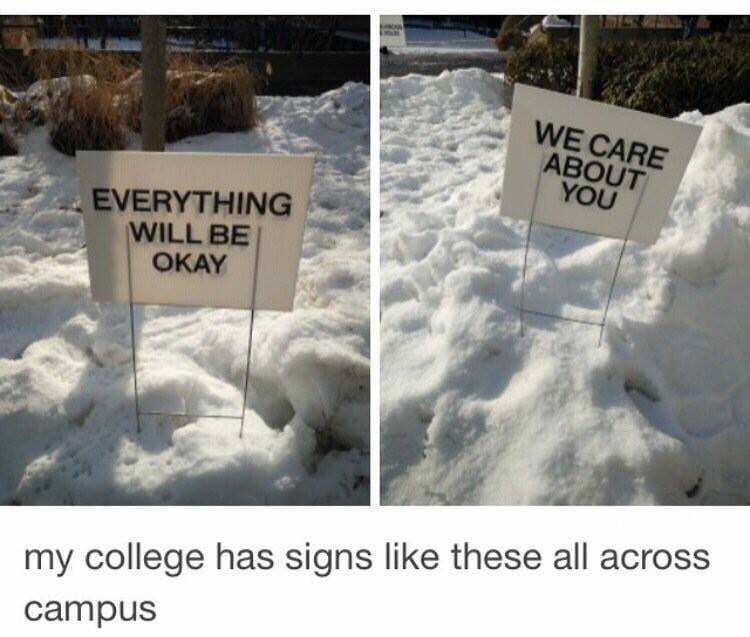 On the subject of college, this college is also offering support. College can be hard on students and teachers alike, and this college just wanted to remind their students that they are available for them if they are going through a hard time. The girl from the last slide probably won’t need it though, because she has such a supportive boyfriend! In the days of Instagram influencers, I think we all need this next meme which reminds us that just because you think someone else is attractive doesn’t mean that you aren’t as well. This meme is so accurately displaying that there are so many different types of beauty in the world and we shouldn’t all be comparing ourselves to each other. We agree! Yeah, we know there is a lot of animal content on this slideshow but what is animal content if not the most wholesome meme material of all time? These penguins certainly fit with that. 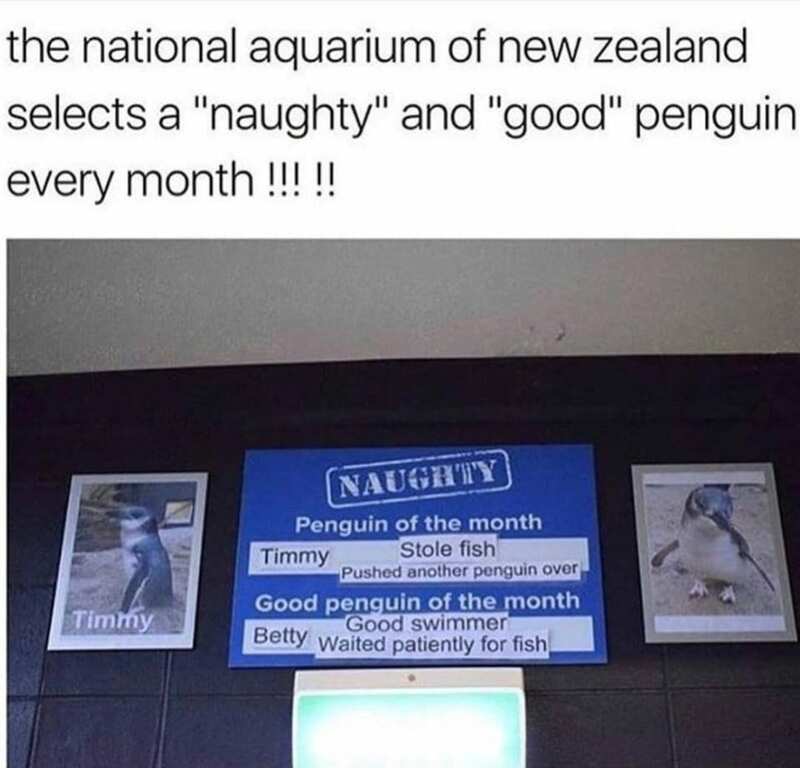 If you were a penguin, do you think that you would be a naughty or a nice one? 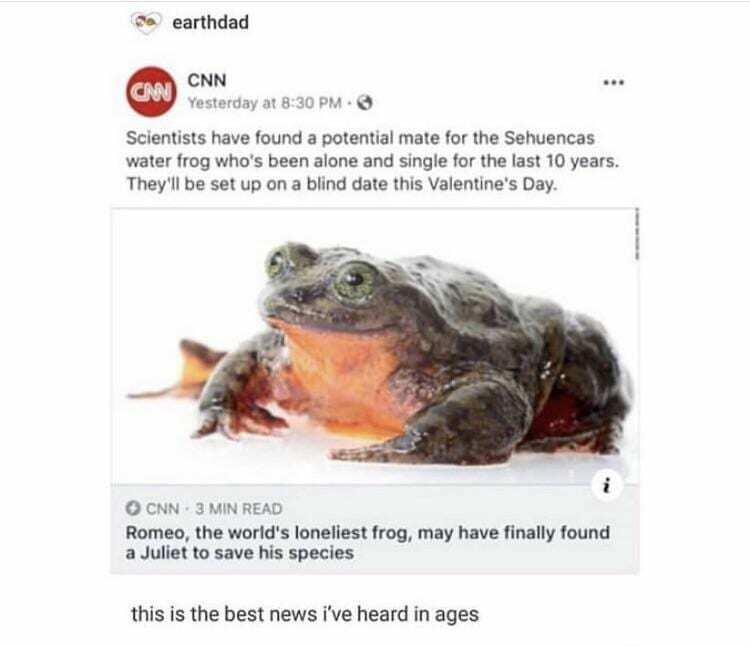 Romeo, a frog who has been alone for the last ten years, is being set up on a date. How scientists determine a potential match for frogs we don’t know, but we certainly wish Romeo and his lucky lady (maybe named Juliet?) the absolute best! Hopefully next year they’ll be celebrating their anniversary. 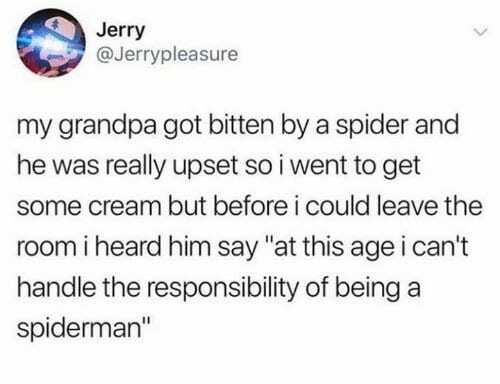 Personally, I would love to be spiderman (even though I hate spiders so I’d prefer to be turned without the spider bite thank you very much) but apparently this Grandpa did not! And it’s understandable: he’s lived his whole life, now might be a little late to finally become Spiderman. What would you do if you were him and got bit by a radioactive spider? 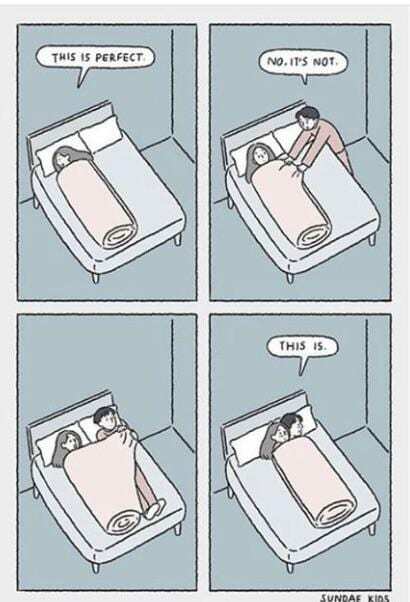 This sweet meme about cuddling is one of the sweetest things we’ve ever seen. There is almost nothing better than being cuddled up in bed alone covered in blankets. Probably the only thing better than that is doing the same thing with your partner! And this guy, who interrupts his partner to come cuddle with her, totally gets that. Yes, we’re back with more college memes but learning is wholesome and fun. And sometimes in college, it’s can be really hard to find a professor for a class that you really love and he seems to actually enjoy teaching the class. That’s why when it happens, you do show up to class with a smile and feeling totally happy. We get it for sure. Homelessness is NOT a happy wholesome meme. 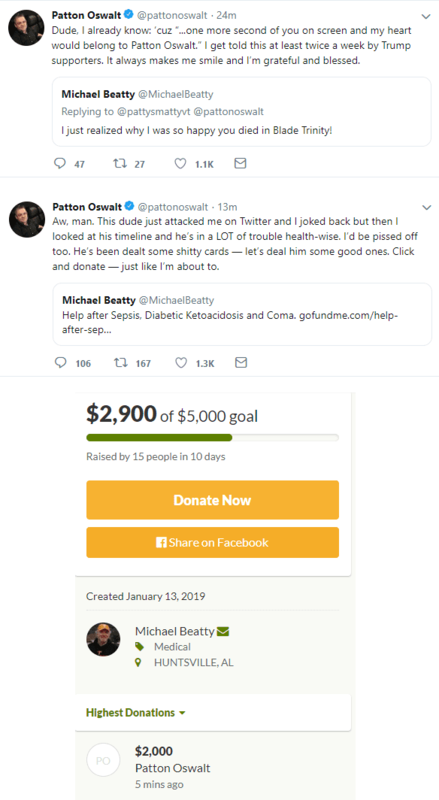 But people helping out a man who is homeless to get food and a get a job? Very wholesome. We all know people that have been through hard times and need a little help, and with so much hardness in the world, sometimes it’s hard to do everything you can. 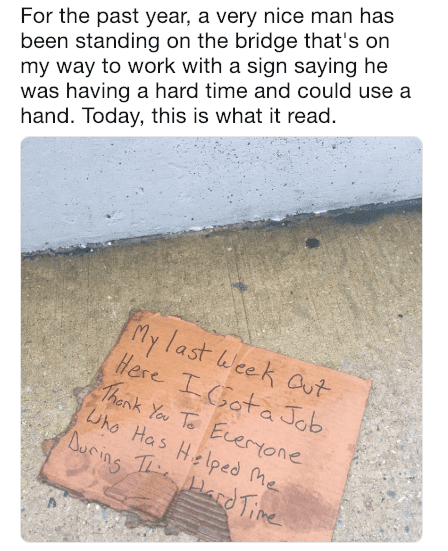 That’s why seeing yourself make a positive change in the world, like helping this man, is the most wholesome thing. 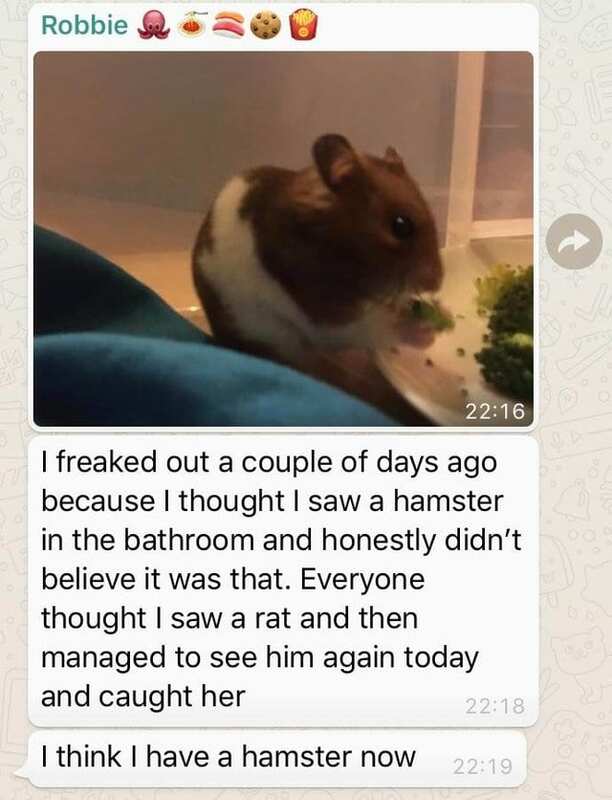 What would you do if you found a hamster in your house? I know first and foremost I would be asking, how did it get there? But then once you got past that point, would you keep the hamster or take it to the pet store? This guy seems to be embracing his new family member, which we like. This drake meme is a an absolute classic. We’ve all seen so many Drake memes like this over the years but most of them are not so wholesome. 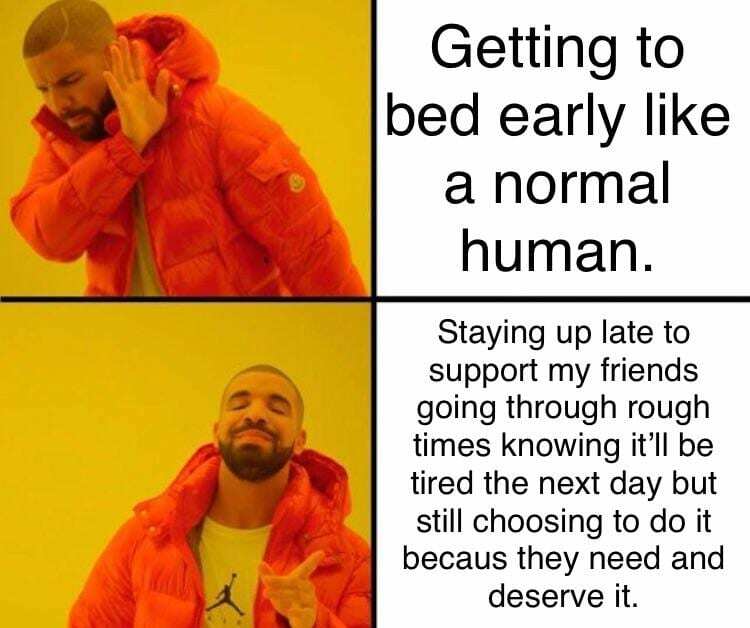 However, staying up with your friends to help them through a hard time is very, very wholesome. Even if it means you’re losing a lot of sleep – you can always make it up the next night. Do you see the dog wearing the firefighter hat? How sweet. 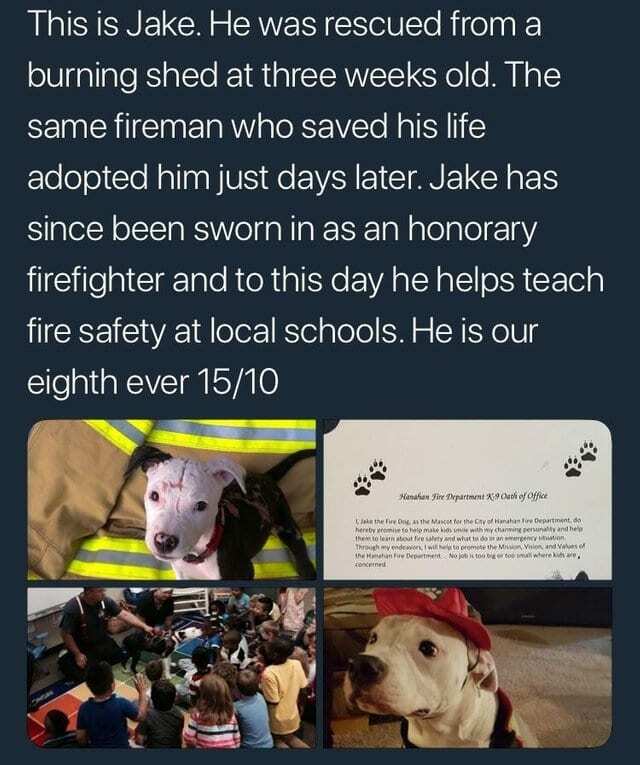 After this dog was rescued from a fire, he was immediately adopted by a firefighter and then sworn into the force. I don’t know about you, but if my house was on fire and this dog showed up to save me, I would definitely be happy! A boost in morale for sure! Wow this a combination of everything wholesome: animals, helping your friends, and cartoons. This meme manages to combine them all in one extremely cute meme. 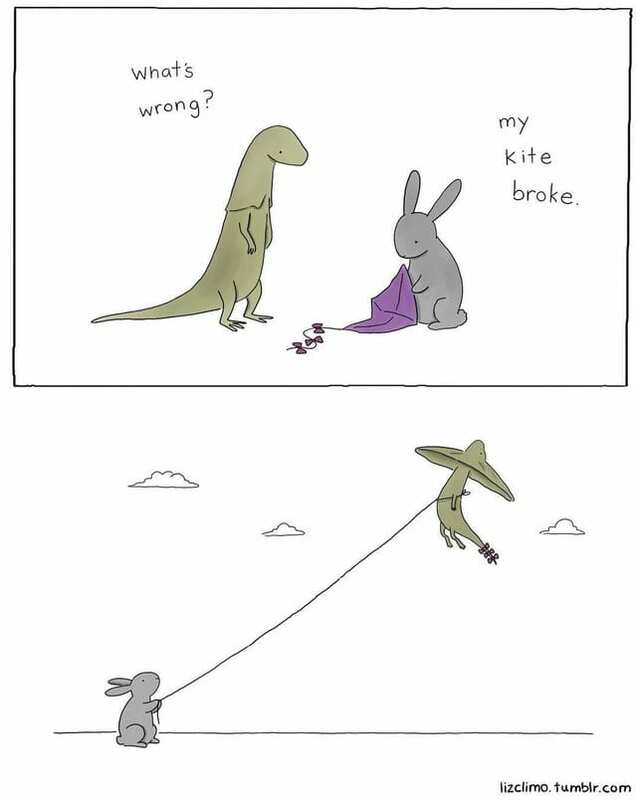 I don’t know if in real life lizards and rabbits are friends (or fly kites) but we love to see them together in this extremely wholesome meme. 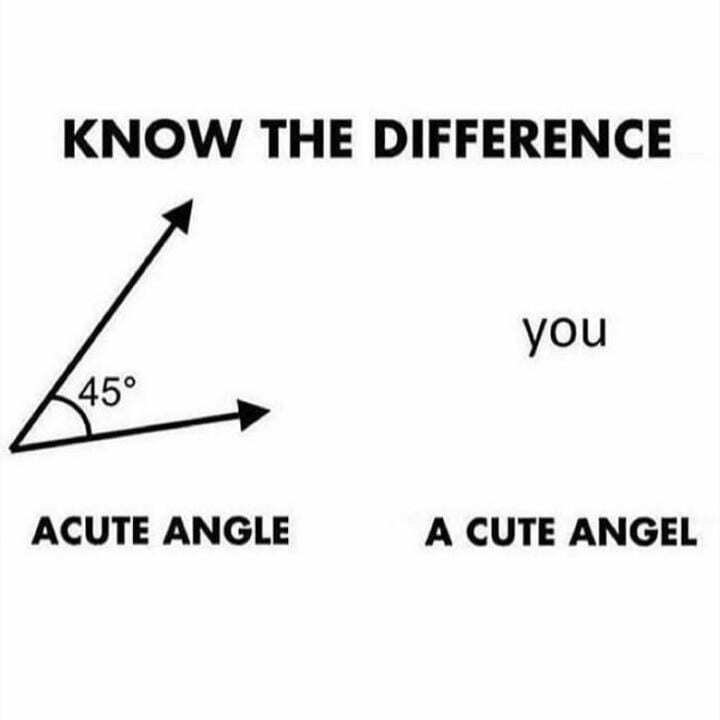 Math, not some wholesome when you’re in high school, but definitely wholesome in meme culture. This sweet play on words will make you smile at least a little bit. 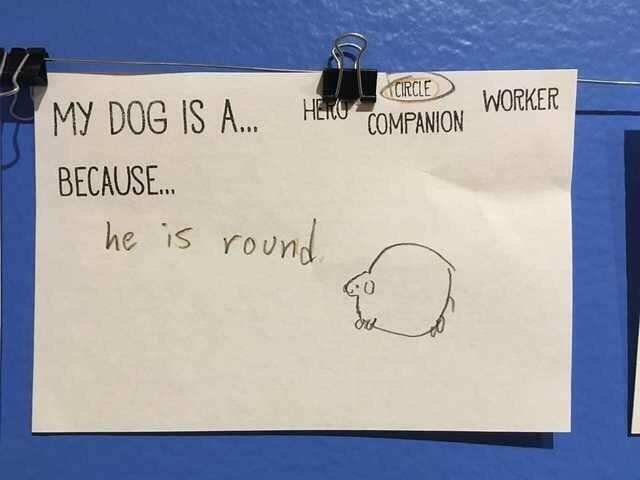 Plus, if you are still trying to learn your geometry, this meme might help you remember! It’s always nice when your parents hold onto things from your childhood. 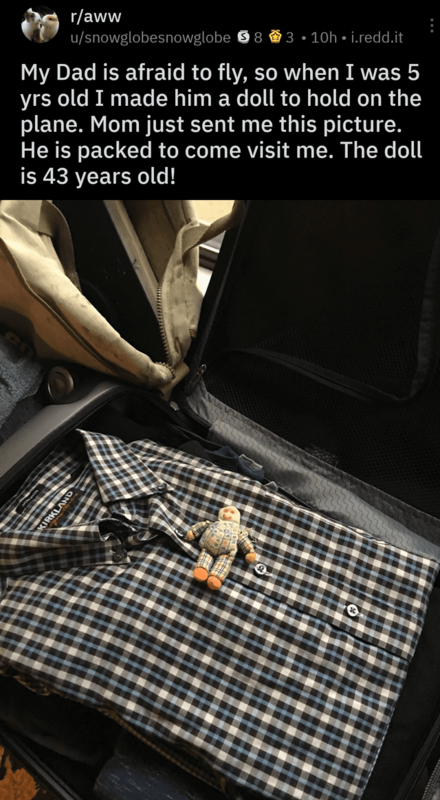 It’s so easy to lose things or hide them in boxes, which is why the fact that this parent kept this doll for 43 years is so sweet. What’s your favorite thing you made as a child? Do your parents still keep them? 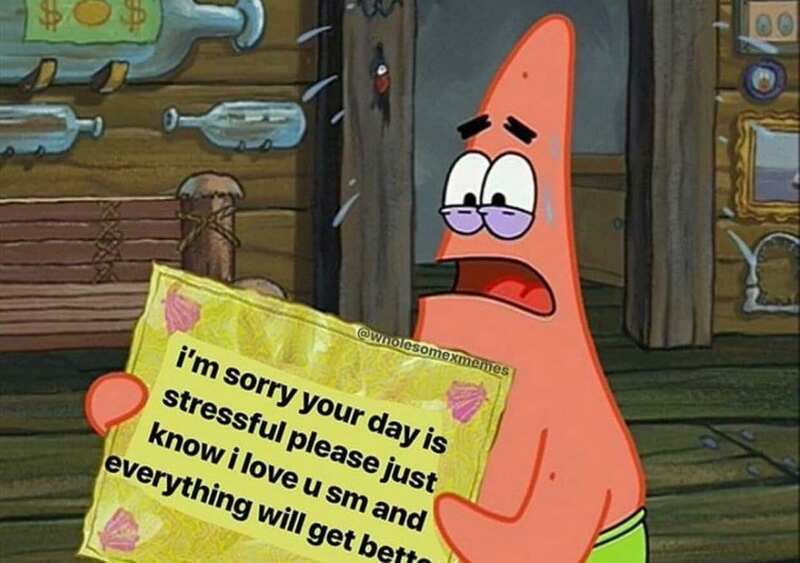 Sometimes that I think that Patrick from Spongebob is actually the reason that wholesome memes exist. Patrick is so nice and supportive os Spongebob, and is overall just a very great person (starfish). And in this meme, he’s no different. He’s here to help you by reassuring you that your stressful day will get easier. Thanks, Patrick! Gordan Ramsey is not always wholesome, for example, have you seen Hell’s Kitchen? But if this classic twist on Chef Ramsey, he is the definition of a wholesome meme. Showering your friends with love and attention? Absolutely sweet and wholesome. 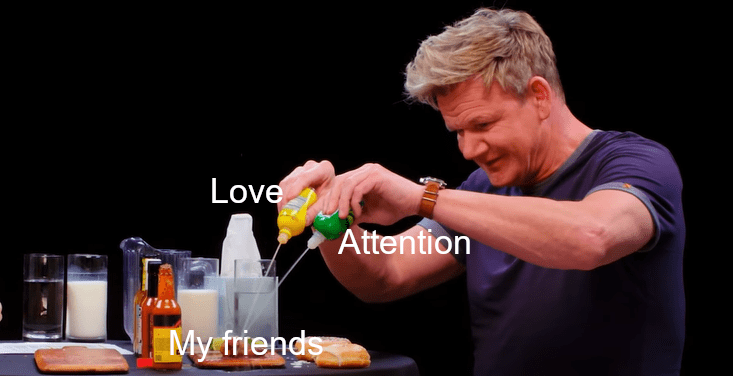 Maybe Chef Ramsey will take some notes from this meme and start showering his chefs with this sort of love and attention. 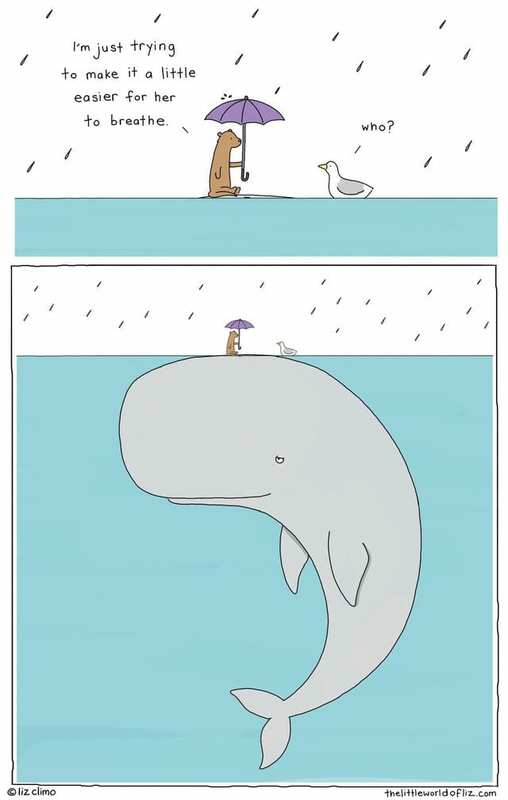 Nothing sweeter than this animal in the ocean sitting on the top of a whale helping them breath a little easier in the rain. We can all use a little help to breathe sometimes, and this whale is no different. Hopefully he or she was able to get through the rain with a little help from his friends! Yes, another meme about a supportive partner. Most people are 60% water but this girl is 100% love for her girlfriend and we are 100% here for this. We think that everyone in a relationship should be like this – if you’re not, maybe try drinking less water? Okay, we are so here for this. Cows get a bad reputation but they are actually so nice and sweet and love to be pet. 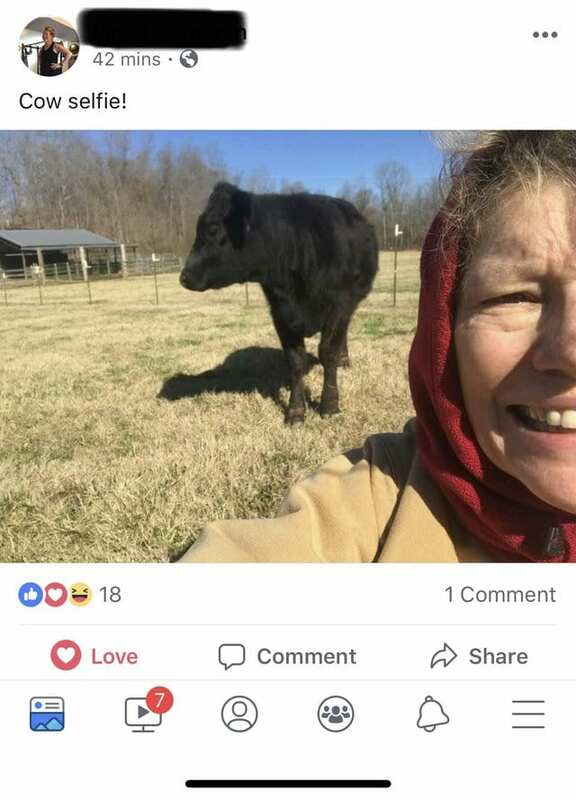 If you have the opportunity, would you take a cow selfie and pet a cow? We certainly would, and maybe even feed it a treat! You know the feeling – you walk onto your plane and sit down right next to a baby. Now, we all feel for the babies (my ears hurt when I fly too), but it is still super annoying to be next to a crying baby the whole time. 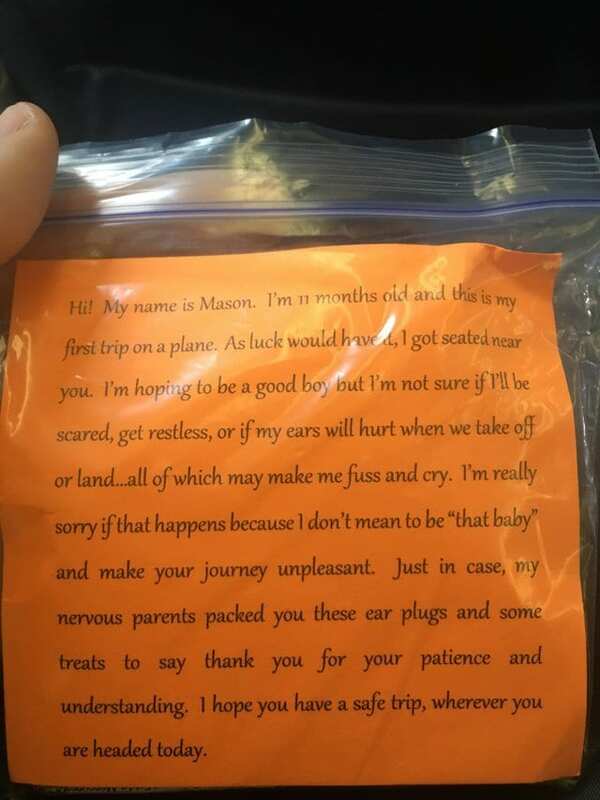 That’s why these parents were nice enough to provide their neighbors with earphones to help them on the journey. Hopefully it made flying a little bit easier for everyone. 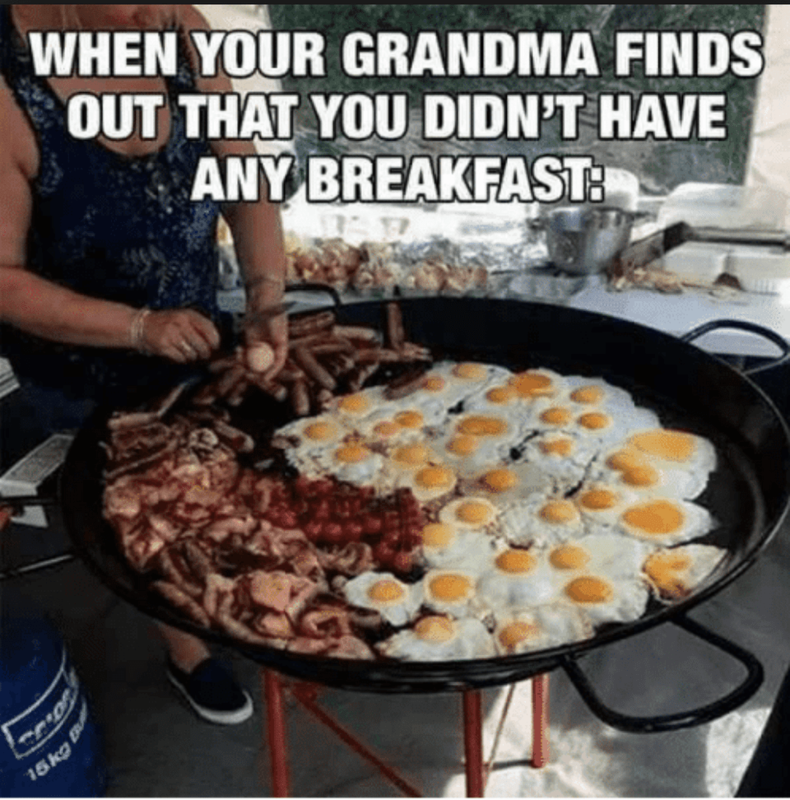 We all have that family – the family member that is never sure if you’ve eaten enough and is running to the kitchen as soon even imply you’re a little bit hungry. This meme perfectly exemplifies this feeling. When you’re hungry, it is absolutely amazing… when you’re on a diet, not the best. Either way, happy eating! 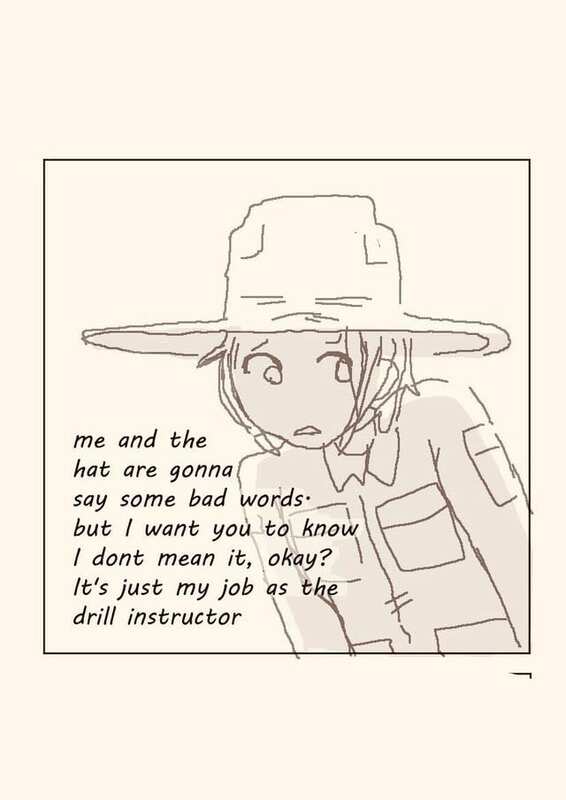 This drill instructor is not trying to be rude, but they are going to have to say some bad words. 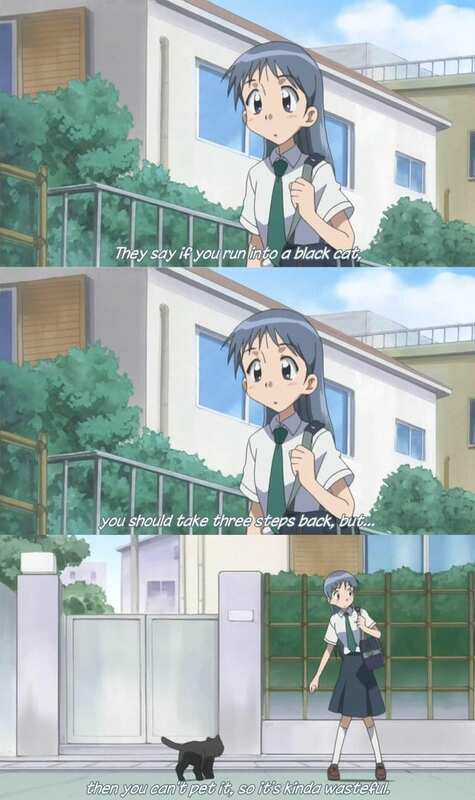 Sometimes you just need to say some bad words! But it doesn’t always mean you’re angry and this woman really wants you to know that! Sometimes, we all just need a hug from our moms. No matter how old you are, you’re really never too old to get a big hug from your mom and this meme says that exactly. If you’re around your mom, go hug her right now! You’ll both be better off from it.